just add more sprinkles: The dreaded SPOON! 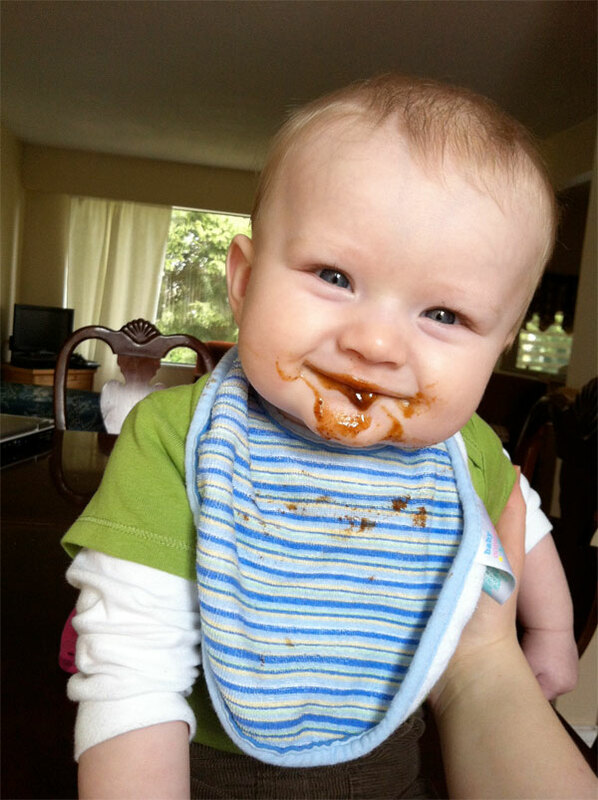 When I started feeding Lucas solid food, I figured he'd love it. He loves eating and is a big hungry boy. I started him with rice cereal. He gave me the weirdest look and clenched his mouth shut. Not thinking much of it, I tried to get him to take another bite. He looked at me with disgust and pushed himself back into his seat, not wanting anything to do with this. Ok, maybe he doesnt like this stuff. So a few days later we moved on to banana, avacado, then sweet potato, and back to rice cereal. Nope, he was just not going for it. He despised lunch time. Anytime that spoon came near him, he'd have his lips sealed. I tried a softer spoon, nope. Then one desperate day, I put pears on my finger and stuffed it in his tightly clenched mouth and, whaaa??? Success! He ate a few bites off my finger, but as soon as I picked up his plastic spoon, he threw himself backwards and it was over. You'd think that with a toddler who loves to chew on anything, be ok with a pliable spoon filled with delicious things. Nope. On and off for weeks now we've been fighting this battle. The spoon was losing, until today. Today I forced that spoon of prunes into his mouth, and you know what? He ate it, no spewing of food, no thrashing. It was strange. He'd need me to force it in his mouth, but he'd eat it, and I think kinda liked it. Maybe I wore him down all week with trying. I'm just happy hes eating solids. Tomorrow I go to buy a big girl a booster seat for the big table so Lucas can take over her chair.